Want to easily earn money for sharing a class project, group service project, or your vision for impacting society or the environment? 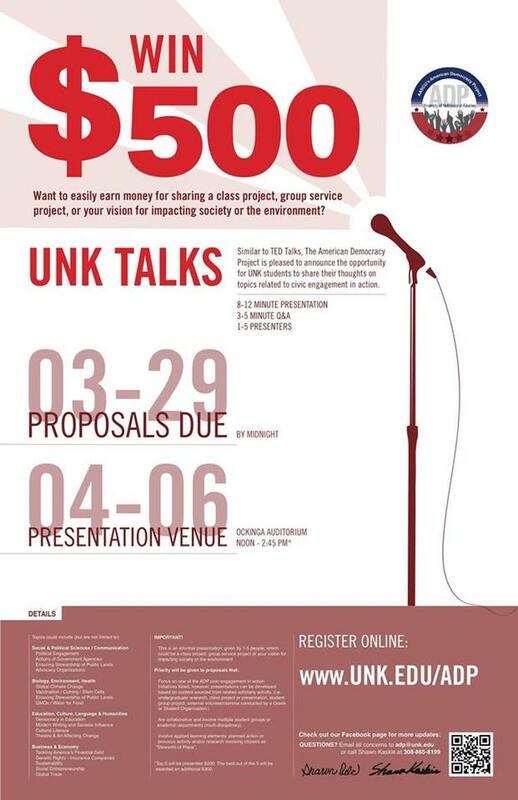 Similar to TED Talks, The American Democracy Project is pleased to announce the availability of funds dedicated to supporting UNK students willing to share their thoughts on topics related to civic engagement in action in this exciting new pilot opportunity. The goal of the American Democracy Project is to produce graduates who are committed to being globally informed and involved. To submit a presentation proposal, click here. To view to scoring Rubric, click here. To view 2018's event poster, click here.